Diebenkorn: Beginnings, 1942–1955 is now on view at the Crocker! Beginnings is a great way to get to know Richard Diebenkorn’s early career and explore his artistic progression from figuration to abstraction and his eventual return to figuration for a time. While Diebenkorn is often solely associated with abstract expressionism (like his Ocean Park series 1967–1988, seen in the Matisse/Diebenkorn at the SFMOMA this summer), he did not begin his career in that style. Diebenkorn’s earliest works are on view in Beginnings, many of which haven’t been seen in 75 years, and some of which have never publicly displayed. These works reveal Diebenkorn’s early days of figurative painting and drawing, including landscapes and intimate sketches of soldiers, affirming Diebenkorn’s broad scope and undermining the misconception that he started out as an abstract expressionist. Following Diebenkorn’s evolution from a young student to a mature artist, this exhibition delves into his ever-curious nature and journey to find his voice. Viewers are afforded an opportunity to witness how Diebenkorn drew inspiration from an array of influential artists, including former instructor Erle Loran and his contemporaries Clyfford Still and Willem de Kooning, among others. As his style evolved past his initial landscapes and figurative drawings, Diebenkorn spent years exploring Abstract Expressionism. Yet beginning in the late 1940s and early 50s, he slowly broke away from his “stylistic straightjacket” as he called it, incorporating representational elements into his paintings once again. Richard Diebenkorn, Urbana #2 (The Archer), 1953, oil on canvas, 64 1/2 x 47 1/2 in. (163.8 x 120.7 cm). © Richard Diebenkorn Foundation. Diebenkorn’s pivot away from the nonobjective becomes evident in Urbana #2 (The Archer) (1953) on view in this exhibition; there is a clear outline of the figure of the archer and his bow, along with an identifiable red hand. This strays from the artist’s previous attempts for years to escape all representation. Completed in 1954, drawing inspiration from the Bayeux Tapestry, a Medieval embroidery showing the Norman Conquest of England in 1066, Diebenkorn’s Horse and Rider clearly depicts a man on a horse. 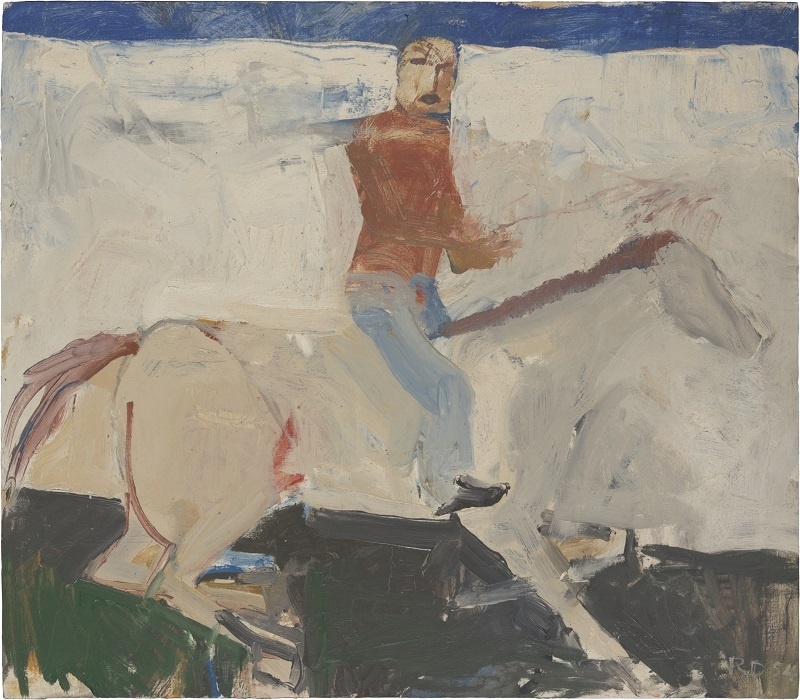 Untitled (Horse and Rider) (1954) is Diebenkorn’s first mature, overtly figurative painting. It would take a year after this painting for his short-lived return to representational to be complete. Finished in 1954, this painting is located at the end of the exhibition, in both period and positioning. Come see Urbana #2 (The Archer) and Untitled (Horse and Rider) in person, along with 98 other works by Diebenkorn on view through January 7, 2018. Cover photo: Richard Diebenkorn, Untitled (Horse and Rider), 1954, oil on canvas, 21 x 24 in. (53.3 x 61 cm). © Richard Diebenkorn Foundation.